The Vietnam National University – Ho Chi Minh City (VNUHCM) and the National University of Laos signed a memorandum of understanding (MoU) on cooperation in Vientiane on January 26. According to the pact, the two establishments will exchange lecturers, post-graduates, students, and scientific publications, and jointly organise seminars, conferences, and talks on specialized themes. The Vietnamese university will offer scholarships to teachers and students at the Lao school, and help enhance the researching capacity of Lao researchers and lecturers, particularly in the field of information and technology. 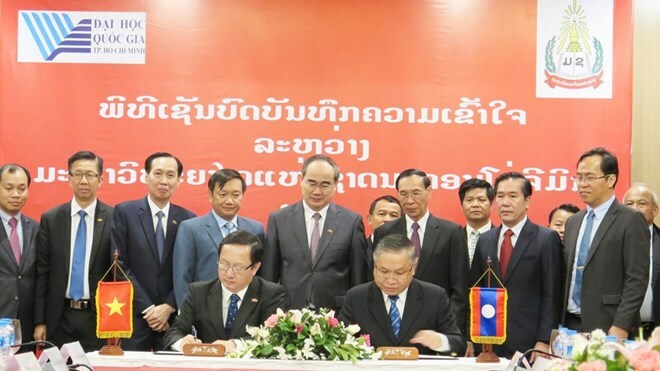 Speaking at the signing ceremony, VNUHCM President Huynh Thanh Dat said the Lao university is among the first universities in Southeast Asia to set up partnership with the VNUHCM, with the sides signing their first MoU in January 1998. The two universities have worked together to organise visits, joint studies, student exchanges, and seminars, he said, noting that the latest MoU proved that they will continue their collaboration for quality tertiary education in Southeast Asia. Praising Ho Chi Minh City’s support toward Laos’ education sector to date, Lao Deputy Minister of Education and Sports Boualane Siripanya stated that the freshly signed MoU will contribute to bilateral cooperation and Laos’ human resources development.